I reported on Nydia Tungsten before as the owner of the cool Club Castaway with its pirate theme. But there more to the white vixen then just being a club owner. In fact she also owns the Club Zero Gravity and the Happy Vixen. in addition, she runs Angels Beach Land Rentals. The most she has run at one time was 11 clubs. She does a good managing those clubs at the real-life price tag of under $500 for renting the land every month. However she did say, "I am almost to the point of making real-life money." Thanks to her Second Life mother Skylark Lefavre, Nydia is an expert of running her own clubs, "She is my SL Mother…. I met her my second day here, and she has been a guiding force in my life here. Lucky Nydia. I’ve been in Second Life for 5 years and I don’t anything about running a club. I didn’t even know where to look for furry clubs when I was a newb. Nydia is a successful club owner as she always listens to what everyone wants to see at her venues. I used the example of what the original owner of the real-life fast food chain McDonalds Roy Croc said, “Take care of the customer and the business will take of itself.” Luckily Nydia’s clubs are healthier than fast food, but Nydia’s clubs are very successful nonetheless. Also she’s a counselor to her friends. She helped out Dusk, one of the Sunweavers who was dealing with the real-life death of one of her friends due to cancer: Artistic Fimicoloud, who was deeply loved by all the Sunweavers and her freinds. Dusk is one of the Sunweavers in the Second Life group of the same name. The Sunweavers is a furry group headed by Rita Mariner. Dusk is also one of the leaders in the Relay for Life fundraising team "Passionate Redheads,” which I reported on in one of my earlier articles with Sabine. Nydia Tungsten told me, "She is one of the most loved Sunweavers and one of the new leaders of the RFL team 'The Passionate Redheads.' I recommend that team to anyone wanting to join a team, by the way." She also talked about a friend whom said she has a year left to live, "She made a comment I have heard so many times before....when she told people about it they go quiet. If someone tells you something like that ... yes it is from left field and a shock. But you need to talk to them, let them talk about it, because they are more in shock than you and need to talk, so let them." I commented a few times that listening is also a good part of being a telemarketer to make sales. Seems like it’s a great way of being a friend too. 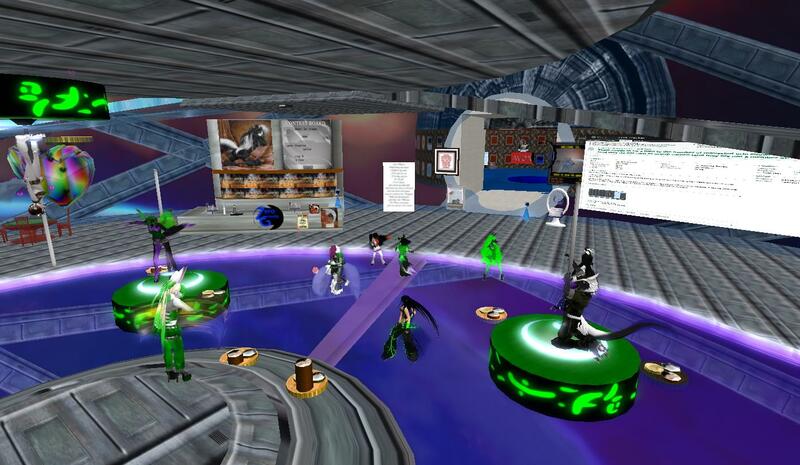 Next time you come to Second Life, stop by one of Nydia’s clubs. You may catch her djing. Or if you have something that’s bothering you she’ll be glad to lend an ear. Or if you just need a laugh, ask her about the reindeer song Shockwave wrote.